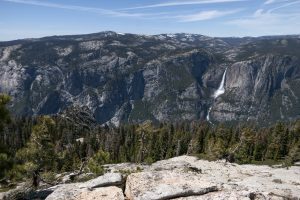 This loop along Glacier Point Road combines a hike to a granite dome and a breathtaking overlook, both with amazing views. Visit Sentinel Dome first by taking an immediate right at the first junction. Follow the trail through a mix of trees and manzanita and up to the dome with it’s panoramic views (see Sentinel Dome for details). Return to the base of the dome and stay left as the trail begins dropping toward Glacier Point. Follow the signs for Taft Point, and stay left again near the cell tower to head southwest along the rim. This section passes through a forest of fantastic, large trees with occasional views looking down into Yosemite Valley. After crossing Sentinel Creek, the trail heads away from the rim, passing through a forest with large, glacially deposited boulders. Stay right at the trail junction to Taft Point and follow the trail through the trees and out into the open. You’ll pass huge rifts in the rock, or fissures, that allow you to see deep into the granite on your way out to the scenic point (see Taft Point for details). Return back to the junction, and follow the trail to the right to complete the loop. 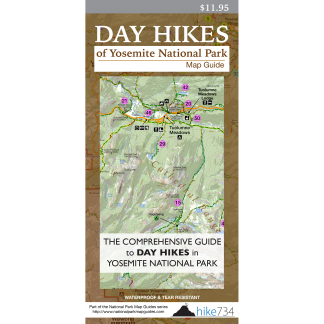 Trailhead: Look for the small, signed parking lot for Sentinel Dome and Taft Point along the Glacier Point Road.